I looked at them for a long time. I just couldn’t get enough. It was late in the day and we were alone on Signal Hill, our truck the only vehicle at the trailhead. As we hiked toward the hill, it looked initially as though we’d only be able to see them from afar, that we’d have to use our binoculars to get a sense of the texture, of the grit of symbol carved into stone. But the trail continued around, winding its way up the mound until we stood close enough to reach out our hands and run them across each line and curve. We didn’t touch them, of course, but the proximity was a siren call, the desire to lay my hands on the stone and feel the ancient symbols breathtaking in its intensity. The distance between each line of the swirls was almost mathematical in its precision. The shapes of the animals and the people and the sunbursts together in an arrangement meant to convey…what exactly? Were they carved to tell a story? An early attempt by some scrivener to archive the tales told by his father’s father? Or were they the work of an accountant’s heart, a bookkeeping note on the profits of the day’s work? 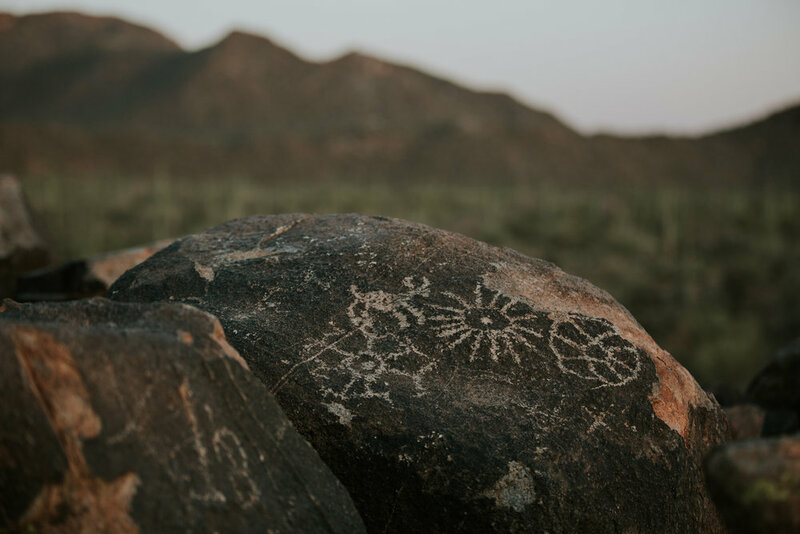 Were they etched solely for beauty, an artist helpless against the pull of these stones and the way they catch the mandarin light of the desert sun as it sets over the Tucson Mountains? Or was it a message from one leader to another as they passed over this arid and unforgiving landscape, a warning or an encouragement or simple directions? Perhaps it was communion with the divine, a holy man’s act of gratitude and devotion? I don’t know. No one seems to be quite sure. But I looked for a long time at the lines and marks carved by some Hohokam man or woman more than 800 years ago and I felt awe and kinship. I looked for the small imperfections, the places where a line veered off course or a design was uneven. When I found them, my heart beat a little faster and for a moment the weight of great mystery lifted just a bit. I don’t know what specific purpose this person or people had in mind as they scraped and scored the sandstone here before me. But I do know what it is to search for a way to leave a mark on this world, to search for the words or the images that will somehow bring permanence to my fleeting existence. I’m not searching for a legacy or fame, merely a way to hold the intangible beauty and pain and confusion and love and grief and excitement of the pieces of my life in my hands for a moment, a way to put them in the center so that I can walk around them in a slow circle and soak them in from every conceivable angle. The need to get a line down, the right line, whether on paper or on stone, stretched through time as I looked long and hard at the work of this ancient. I felt a deep comradeship as I wondered if this was their first draft or their final. Did the carver of these symbols feel that he’d met his potential here on this hill? Did he feel like a fraud when he struggled to get things right? Did he compare his work with others? Or did he simply offer his best work that day with the simple tools he had in his hands, just grateful for the chance to make something beautiful and powerful and resonant? Did he intend his work as a legacy, or did he carve into exposed sandstone feeling free in the knowledge that the winds and rains of time would erase both his efforts and his mistakes? Each day I watch the sun reach for the horizon and send shadows long across the earth or the night sky fill with shimmering stars and I try to etch them into my memory with the kind of force that will keep them there for 800 years. I listen to Justin’s laugh and Tessie’s snoring and the way my Mom says hello when she answers the phone and I scratch away at the sandstone of my consciousness trying to find just the right symbols to withstand the winds and rains of time. I scribble words onto paper and carry my camera into the wilderness and all the while I am searching for ways to leave a mark etched in my memories, my heart. As I stood and looked at the work of ancient hands, I had a flash of a vision: when my days here on earth draw to a close, someone will crack open my chest to find my heart covered in symbols, in swirls and running deer and blazing suns. I will have carved each one despite my fears, despite my doubts, despite my unworthiness. They will scratch their heads as they look at carving overlapping carving- an eagle, a mountain, a squiggle that might be a river- and while they might not know exactly why I carved each one, they will feel a kinship too. Because don't we all know what it is to leave our mark?